I opted for more "cute" with today's bento lunch snack, since I was actually thinking about it yesterday. That gave me enough time to actually piece together the parts (ie. the egg) that needed to be prepared in advance. The piggie bread was inspired by the "Cute Yummy Time" book. Piggies are easy to make! Circle for the head, circle for the nose, circle cut in half for the ears, see the theme here? I thought it would have been adorable with peppercorn eyes, but we wouldn't want the boy to think I was poisoning him now. ;o) Instead, it's all cheese pieces (two colors) and cream cheese to act as the "glue". 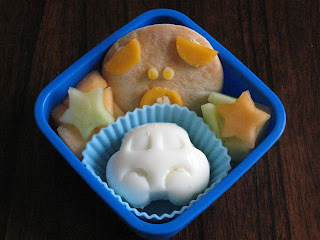 In today's bento, we have a car shaped hard boiled egg, canteloupe and honeydew cut into stars, and a piggie shaped flatbread with cheese parts. He ate it all and told me he wants another piggie bread soon. How, oh how, did you make a car shaped hard boiled egg!?!? How creative! I WANT that book! Too cute! So sweet! My car eggs never turn out as nice as this one. The eggs are from egg molds. Basically, you boil the egg and when it's still hot, peel it, pop it in the mold and refrigerate it. I think what worked better this time is I used extra large eggs. We made a fish & a bear too and they all looked better than normal. So funny! You are very creativ! Your blog caught my eye. I sure wish my kids weren't 32, 28 and 26. If I ever get grandkids maybe I can do this for them....I love those egg mold.